Easter is Sunday, April 21, 2019 this year. 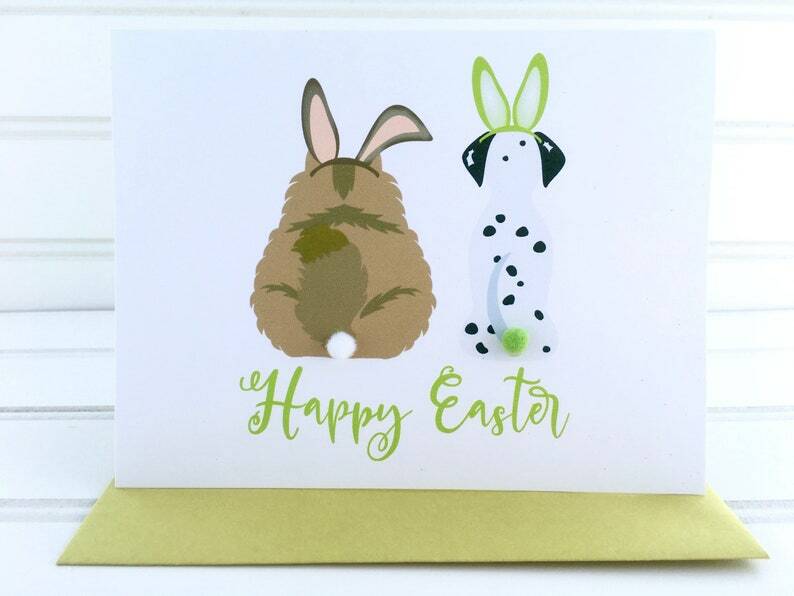 This cute and funny Easter greeting card is perfect to give to a cat and dog lover, pet owner, or anyone that loves cute fur babies and has a sense of humor. This card can be fully customized and personalized at no extra charge and also includes a free matching colored envelope, round envelope seal, and a U.S. Forever postage stamp. On the front of the card, there is an illustration of a cat and dog dressed up with bunny ears and a furry, bunny tail. Beneath the illustration the message says, "Happy Easter". This card measures 4.25” x 5.5” when folded and is blank on the inside. Cute card! Unique and well made! These cards were so adorable! It was a one-of-a-kind design for a one-of-a-kind day. I appreciate the care with which they were packaged for shipping. A delight to order and send out, thank you! Such a cute card! Really like the unique addition of the "made for" on the back and the kind inclusion of a postage stamp.